The road to St Johann im Pongau, dug out (again) this week! Big snow all over; from North America to The Dolomites and (most) all points in between. - Huge snowfall in the Dolomites; some areas reporting 2m+ (6ft+) of snow in 7 days. - Snow depths in the Pyrenees pass 4 metres after more heavy snow. - Heavy snow in Italian Alps, eight off-piste avalanche deaths. - Scottish ski areas open more terrain as snow falls and cold weather continues. - Huge snowfalls in California's Sierra mountains force ski areas to close. The last week has seen a lot of snow, falling pretty much everywhere in the northern hemisphere for once. The biggest falls in the Alps, Dolomites, Pyrenees and North America have each totalled over 2 metres in the period. The past few days, again almost everywhere, have calmed down though - with much lighter snowfall and more settled conditions prevailing now. It has been an unusual week for world snowfall in two key respects. First, there has been a lot of snow and it has been falling pretty much everywhere. The biggest falls in the Alps, the Dolomites, the Pyrenees and North America have totalled over 2 metres in each area in the same week. Second is the synchronisation – the heavy snowfall wasn't quite at the same time everywhere in the world, but it was pretty close, and by contrast, almost everywhere in the world, it has gone very quiet since the start of this week, with much smaller snowfalls, if any, reported in recent days. So a quick rundown. The latter half of last week into the weekend was snowy across the alps with the West seeing slightly more, but unlike previously, it was snowing pretty much everywhere, not on one side or the other. The avalanche danger hit Level 5 in places, maximum danger, and sadly there were some fatalities off-piste. The Dolomites saw their biggest snowfall of the season so far and it was the second week of heavy snow for the Pyrenees. There was snow in Scandinavia, Eastern Europe and Scotland too, the latter seeing ski areas able to open properly, at least partially, for the first time this winter. Across the Atlantic a massive snowstorm hit the Californian coast and raged from Saturday to Tuesday, burying, in some cases, cars and even chairlifts. Up to 3 metres/10 feet fell and several resorts were closed by the snow and strong winds but are returning to normal now. Clear and settled for the next couple of days, with temperatures in the mountains feeling mild at times, before the cold returns with - yes - more snow early next week. See where it's expected to snow this week... Kashmir and Turkey in line for the next few days! Great conditions in Austria with the sun back out in most areas after a snowy week. That said, Seefeld did report 20cm of fresh snow on Wednesday morning and the picture is starting to look snowier again into the weekend. But right now pretty well every run is open at every Austrian resort after the snow-excess closures of January and the Kaunertal Glacier is reporting the country's deepest snow at 5.6 metres – nearly 19 feet. 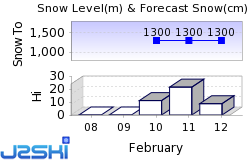 St Anton, which was posting the country's deepest snow a week ago, is on 525cm. Superb conditions in the French Alps with the sun out after a snowy week up to last Saturday/Sunday. Ski resorts have reported 50-150cm of fresh snow in the past week so conditions are now fantastic and the avalanche risk has diminished from Level 5 (the highest) issued at the end of last week. The Grand Massif region around Flaine is posting the deepest base in the French Alps at 320cm, with Ste. Foy in second place on 285cm but bases are looking very healthy across the country. In fact, the very deepest snow, in a complete switch from the first 8 weeks of the season, is now down in the French Pyrenees (see entry below). Italy had quite a week last week posting some of the biggest snowfalls in the Alps in the Northwest of the country and also seeing some huge snowfalls in the Dolomites in the Northeast – several resorts there totalling more than they'd received during the previous two months in just two days. In the West the heaviest snow for the entire Alps was reported at La Thuile with more than 2 metres. Similar numbers were posted by Cortina d'Ampezzo and Val Gardena. The Lombardy region between the two also reported huge accumulations. All the snow caused problems of course with ski runs closed across the north, including the famed Sella Ronda circuit in The Dolomites at the weekend, and the avalanche danger was extremely high. Sadly eight people died in several off-piste avalanche incidents, the majority around Courmayeur. As with the rest of the alps, there's been little fresh snow in Switzerland in the past few days. The last reported on Sunday and Monday totalled 30-60cm in Graubunden and Eastern Switzerland. As with most other countries in the region, there are now generally great conditions with fresh snow cover and blue skies. Andermatt still has the world's deepest base at a reported 6 metres (20 feet) although that total hasn't changed for a few weeks now. Engelberg is in second place in Switzerland with 5.4 metres. It's clear and cold in many parts of Scandinavia, including the area around Are in Sweden where the Alpine Skiing World Championships are now underway. Here temperatures are -20C but otherwise racing conditions are pretty much perfect. There has been some snow though, particularly in Norway, where several areas have reported 20-30cm of new snow in recent days. The heavy snowfall in the Pyrenees has continued into a third week and at the start of this week several ski areas in the region were amongst those reporting more than 2 metres of snowfall in the previous 7 days. Cauterets in the French Pyrenees is reporting the deepest base in the country at 4.5 metres. Things are finally quietening down again now though with only light snow forecast occasionally for the rest of this week, although in the longer term it looks like there could be another heavy snowstorm at the start of next week. A continuing improving picture in Scotland where all five areas in the Highlands were able to open at least some terrain that was more than the small beginner areas open so far this season, for more experienced skiers and boarders to enjoy. There's been some fresh snow and the past week has seen mostly sub-zero temperatures for snow-making and whilst conditions are still fairly marginal, more and more trails are opening. The forecast for the week ahead is mixed with temperatures rising but also more snow forecast so hopefully temps won't rise too much. It has been a snowy few weeks in Bulgaria culminating in a few days of light snow bringing 10cm or so of new snow through this week. Bases are looking really healthy after the January snowfall with Pamporovo reporting more than three metres (10 feet) lying from the top to the bottom of the slopes, but depths are healthy, if not quite so impressive, at the other Bulgarian ski areas too. Bansko and Borovets are both fully open. The week ahead no looks dry with conditions staying cold on the slopes but possibly going above freezing at resort level over the weekend. Canada has had a fairly quiet week for snowfall compared to its southerly neighbour (of which more below) with just 10-30cm accumulations through the week and across the country. The deepest snow remains on the Eastern Side with Tremblant in Quebec reporting the snow more than 3.6 metres (12 feet) deep. There were some significant snowfalls around Whistler on the West Coast last week and a few 20-30cm 24-hour accumulations at resorts like Fernie and Sunshine on either side of the BC/Alberta border at the weekend but nothing much since. The week ahead looks very similar. Snowmaggedon hit America's West Coast on Saturday and kept dumping for four days, driven in on 100mph winds, so it wasn't pleasant, or very safe, to be outside, and a number of resorts closed for several days until it blew through. Mammoth reported the biggest snowfall totals of all hitting 3 metres (10 feet) by Tuesday evening, exactly as forecast. It was one of the areas that closed due to the extreme weather and has the continent's deepest base at 495cm. Other areas like Dodge Ridge, Sierra at Tahoe and Homewood all reported more than 2.5 metres of snowfall too. The snow wasn't confined to Colorado and there were huge snowfalls in Montana, Utah and other western states too with ski areas including Jackson Hole and Snowbird big beneficiaries. It was less dramatic on the country's East Coast, and a little warmer than a week ago when temperatures were often around -20, but there was still some fresh snow there too. The week ahead currently look much calmer across the country with no more big dumps in the immediate forecast. Until next week... send us your snow pictures! 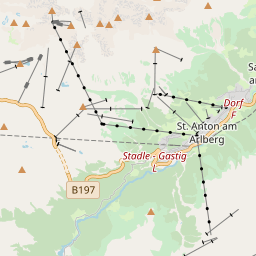 Ski Hire Shops in St. Anton am Arlberg and Seefeld.